It was a truly glorious evening of musical camaraderie at The Ear Inn (326 Spring Street, Soho, New York City) but that’s completely typical of what happens when the EarRegulars get together on Sunday nights from around eight to around eleven. Here and here are wonderful highlights from earlier in the evening — marvels created by Jon-Erik Kellso, trumpet; Scott Robinson, tenor saxophone and mellophone; Matt Munisteri, guitar; Pat O’Leary, string bass. I call them “marvels” with complete confidence: listen closely to the inspired conversations that take place in each performance (this is a listening band), the sonic variety — each player making his instrument speak with a wholly personal voice — the melodic inventiveness, the wit and tenderness, and the swing. For the closing three performances, Scott Robinson also brought out his rare Albert system “C” clarinet with the Picou bell — rarity upon rarity (Clint Baker owns one — it was Tom Sharpsteen’s — and Alan Cooper handmade his, but how many others are there on the planet?) which has a lovely persuasive sound. And the young Russian reed wizard Eldar Tsalikov spent his last evening of his New York trip, happily, here, playing alto saxophone and clarinet. Lovely, fully satisfying inventiveness. Every Sunday night at about eight. Two footnotes. One (*) is a small mystery that so far I haven’t found an answer to. When Herschel Evans died in 1939, he was not yet thirty. And somewhere I have read that he was married and that his wife was around the same age. What happened to Mrs. Evans? Two. Some viewers comment acidly (here and YouTube) that people in the audience are talking. But to rage in print at people on a video seems ineffective. I delete these comments, because there’s enough anger in the world as it is. I hear the chatter, too, but I am grateful for the music, no matter what is happening around it. As an analogy, I think of someone finding an unissued Louis test pressing and then being furious because the disc has surface noise. “People will talk,” as the expression goes. Accept what you can’t change, and bring your silently appreciative self to a jazz club to reset the balance. I am delighted to share with you the debut CD of an inspired quartet — the Unaccounted Four — a disc called (appropriately) PLAYGROUND, where the arranged passages are as brilliant as the improvisations, and the two kinds of expression dance beautifully through the disc. 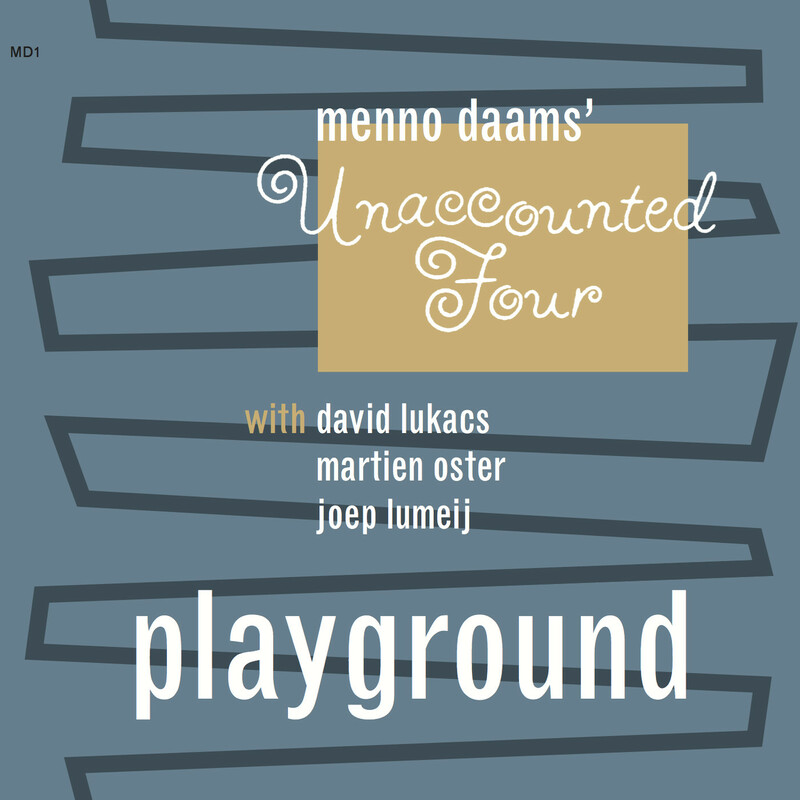 Menno plays cornet, wrote the arrangements, and composed three originals; David plays clarinet and tenor saxophone; Martien plays guitar; Joep is on string bass; Harrie ven de Woort plays the pianola on the closing track, a brief EXACTLY LIKE YOU. The disc was recorded at the PIanola Museum in Amsterdam on four days in May 2014 — recorded superbly by bassist Joep. The repertoire is a well-stirred offering of “classic” traditional jazz repertoire: STUMBLING, CHARLESTON, LIMEHOUSE BLUES, ROYAL GARDEN BLUES, JUBILEE, EXACTLY LIKE YOU; beautiful pop songs: AUTUMN IN NEW YORK, JEANNINE (I DREAM OF LILAC TIME), ALL GOD’S CHILLUN GOT RHYTHM, LULLABY OF THE LEAVES; originals: WHAT THE FUGUE, UNGUJA, PLAYGROUND; unusual works by famous composers: Ellington’s REFLECTIONS IN D; Bechet’s LE VIEUX BATEAU; and Ravel’s SLEEPING BEAUTY. Obviously this is a quartet with an imaginative reach. A few years ago, I wanted to have my own jazz quartet to play what is known as “classic jazz.” Besides being nice to listen to, I intended the quartet to be versatile, convenient and different. That is why I bypassed the usual format of horn + piano trio. Our instrumentation of two horns, guitar and bass allows for varied tone colors. The venues where we play don’t need to rent a piano, and we don’t have to help the drummer carry his equipment from the car. As for versatility, David Lukacs, Merien Oster and Joep Lumeij are excellent readers and improvisers. They are also great company to hang out with (convenience again). Our repertoire dates from the 1920s and 30s. The earliest piece is the adaptation of Ravel’s Pavane de la belle au bois dormant (1912); the latest is Ellington’s Reflections in D (1953), not counting my own tunes. While writing the charts, I chose to frame the familiar (and not-so-familiar) tunes in a new setting, rather than following the original recordings. So, for better or worse, the Unaccounted Four sounds like no other band. I promise you will still recognize the melodies, though! The recording was made at the Pianola Museum in Amsterdam by Joep Lumeij with only two microphones. Minimal editing and postprocessing was done (or indeed possible). On the last track, Harrie van de Voort operated a pianola which belted out Exactly Like You while we joined in. It is the only completely improvised performance on this disc. Autumn in New York is at the other end of the spectrum with every note written out. I hope you will enjoy the Unaccounted Four’s particular brand of chamber jazz. Some listeners may wonder, “If it doesn’t sound like any other band, will I like it?” Fear not. One could put the Four in the same league as the Braff-Barnes quartet at their most introspective, or the Brookmeyer-Jim Hall TRADITIONALISM REVISITED. I think of the recordings Frankie Newton made with Mary Lou Williams, or I envision a more contemplative version of the 1938 Kansas City Six or the Kansas City Four. But here the CD’s title, PLAYGROUND, is particularly apt. Imagine the entire history of melodic, swinging jazz as a large grassy field. Over there, Bobby Hackett and Shorty Baker are talking about mouthpieces; in another corner, Lester Young, Gil Evans, and Miles Davis are lying on their backs staring at the sky. Billy Strayhorn and Claude Thornhill are admiring blades of grass; Frank Trumbauer is introducing Bix Beiderbecke and Eddie Lang to Lennie Tristano and Oscar Pettiford; Tony Fruscella and Brew Moore are laughing at something witty Count Basie has said. Someone is humming ROYAL GARDEN BLUES at a medium tempo; another is whistling a solo from the Birth of the Cool sides. You can continue this game at your leisure (it is good for insomniacs and people on long auto trips) but its whimsical nature explains PLAYGROUND’s particular sweet thoughtful appeal. It is music to be savored: translucent yet dense tone-paintings, each three or four-minute musical interlude complete in itself, subtle, multi-layered, full of shadings and shifts. The playing throughout is precise without being mannered, exuberant when needed but never loud — and happily quiet at other times. Impressionism rather than pugilism, although the result is warmly emotional. Some CDs I immediately embrace, absorb, and apparently digest: I know their depths in a few hearings. With PLAYGROUND, I’ve listened to it more than a half-dozen times, and each time I hear new aspects; it has the quiet resonance of a book of short stories, which one can keep rereading without ever being bored. For me, it offers some of the most satisfying listening experiences I have had of late. The CD can be downloaded or purchased from CDBaby, downloaded from iTunes or Amazon; or one can visit Menno’s own site here, listen to sound samples, and purchase the music from him. Enjoy the PLAYGROUND. You have spacious time to explore it.